If you read the first post in this series, you already know I heartily recommend the Minolta 4000AF as an inexpensive flash unit for the Sony Alpha dSLR cameras. In that same post, I promised to explain how I use the 4000AF with my Alpha and Minolta digital cameras. When Minolta first introduced the Maxxum 7000 AF camera, they offered the OC-1000 as an accessory for the new camera. It was a device that slid onto the universal hotshoe of the original Maxxum cameras and provided a three foot sync cord so you could use your flash off camera. Sony off-camera flash cable is the key to syncing your flash away from the hot shoe. When Minolta updated their hotshoe design in 1988 they also updated the OC-1000. The cable was redesigned to fit Minolta’s new hot shoe design and was now known as the OC-1100 Off Camera kit. Fortunately, when Sony acquired the Minolta photographic assets, they re-branded the OC-1100 and now sell it as the FA-CC1AM Off Camera Sync Cord. Basically, the photographer slides the FA-CC1AM on to the hot shoe, just as they would a Sony flash unit. The cord is 39 inches long (1 mtr) and carries the standard Sony/Minolta flash connector on the other end. Of course the FA-CC1AM is not specific to the 4000AF. You can use it to fire any Sony flash away from the hot shoe. Some flashes, such as the FLV42AM, require a special adapter to provide a connector for the FA-CC1AM. Sony also sells a variety of flash accessories that will allow you get creative with the 4000AF. 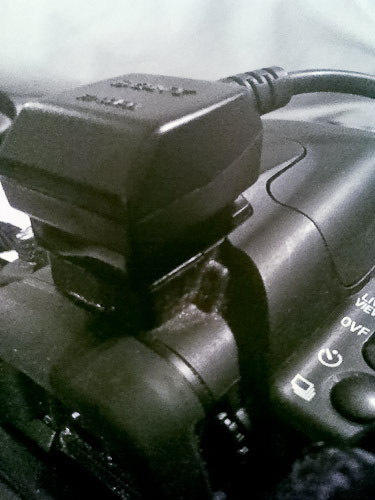 There is a hot shoe adapter, which will allow you to attach the 4000AF directly to the hot shoe. I don’t recommend this for two reasons. First I don’t like hot shoe flash, and secondly attaching the heavy 4000AF to the camera with an adaptor is asking a lot of the adapter. 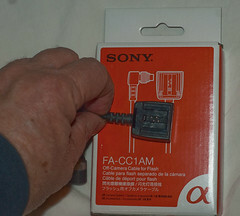 Other Sony products include the FA-TC1AM Triple Connector (Minolta TC-1000) that will allow you to fire up to three wired flashes at a time, as well as the FA-EC1AM (Minolta EX cable) extension cord to add another 39 inches of to the length of the sync cord. Many of these products were also sold under the Minolta name before Minolta transferred its camera assets to Sony. So you should be able to use use the corresponding items from Minolta on your Sony Alpha. Just be aware that the earlier Minolta components, such as the OC-1000 are designed to be used with the older, universal style hot shoe. There do not fit the Alpha, so be sure that any second-hand Minolta flash cords you buy are designed for the newer-style Sony/Minolta hot shoe. There are also third party products that are similar to the FA-CC1AM. 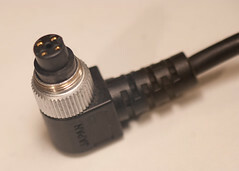 Note that most of these aftermarket cords have a molded hot shoe instead of the screw connector. The hot shoe is designed for Sony Alpha flash units, so you will need an adapter to attach the 4000AF flash. These aftermarket cords are available through ebay and Amazon. I don’t have any experience with these, so I can’t recommend them. On the other hand, designing a sync cord is not exactly rocket science, so I would expect most of these cords to work well. Like anything else, you usually get what you pay for, so don’t skimp. One aftermarket cable I have my eye on is RainbowImaging Ten Foot TTL Off Camera Flash Cord. The FA-CC1AM is fine for moving the flash off the hot shoe, but sometimes the need arises to move the flash a longer distance than three feet. I’ve considered buying one of these long cords so I can have more flash capabilities, but thus far I haven’t got around to it. Again you will need an adapter to use this with the 4000AF flash, as it is designed for the new Sony flash shoe. Of course, the best method of controlling off camera flash is with a wireless system. The 4000AF will not recognize the Sony/Minolta optical wireless flash system, so that avenue is not available. However, there are other methods. Some users attempt to compensate for the 4000AF’s lack of compatibiity with the Sony Wireless System by using an inexpensive optical slave trigger to fire a remote flash unit. Unfortunately, in my experience, this doesn’t work either. The typical optical slave trigger fires when it senses light from the camera’s built-in flash. The problem is that most Sony Alpha dSLRs do not allow the photographer to set the built-in flash to manual mode. As a result, when you shoot with the onboard flash, it always shoots in the TTL mode. In the TTL mode, the Sony Alpha fires a pre-flash beam to establish proper exposure. You won’t usually see the pre-flash because it fires only a millisecond before the actual flash. To the human eye, it appears to be a single flash. The camera, however, fires the TTL pre-flash BEFORE the shutter opens. This in turn, will trigger the remote flash too early, while the shutter is closed. After the camera interpets data from the pre-flash , it opens the shutter and fires the actual exposure flash. If the remote flash is triggered by the pre-flash, it will not recycle quickly enough to fire when the shutter is actually open, meaning the remote flash will not produce any light in the actual photograph. In short, you cannot use a genreric optical slave trigger with the built in flash from most Sony Alphas. I have heard conflicting reports that some photographers have successfully triggered a remote flash slave trigger with the Sony Alpha built-in flash. Possibly they have found an optical trigger that ignores the pre-flash. Supposedly, there are optical slave units that are not affected by the TTL pre-flash, but I don’t know where to find one. Reportedly, the A700 will allow you to set the pop-up flash to manual, thus eliminating the pre-flash signal. In my experience, other Sony Alphas still fire the pre-flash signal, even with the camera in the full manual mode. There is, however, a somewhat simple way around this whole pre-flash problem. If you are using the FA-CC1AM with a 4000AF, you can use the 4000AF in the manual mode as trigger to fire remote optical triggers. Basically, when you fire the 4000AF in the manual mode, it doesn’t fire a pre-flash beam. 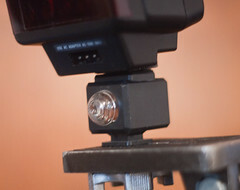 As a result, you can use an inexpensive slave trigger with any hot-shoe flash as your remote. Since I have multiple 4000AF units, I typically use the 4000AF as both the trigger and the remote. However, you can use this trick with any flash unit that can be fired with a optical slave trigger. Professional photographers prefer using radio waves to trigger a remote flash. Radio triggers have several advantages over optical triggers. First off, an optical trigger requires a clear line-of-site between the camera and the remote trigger. A radio trigger will allow you to conceal the remote flash behind walls, inside props and in other areas not visible to the camera. Radio triggers are also effective over much greater distances than optical flashes. Optical units are triggered by the camera’s onboard flash, which usually doesn’t carry beyond twenty-thirty feet. A good radio trigger can fire a flash hundreds of feet away from the camera. Finally, optical triggers require the camera’s onboard flash to fire, which in turn triggers the remote flash(es). Depending on the nature of the shoot, light from the onboard flash can adversely affect the lighting in the final photograph. Of course, radio triggers are not problem-free either. Sony still has not introduced a radio trigger especially for the Alpha, so photographers who wish to add a radio trigger to their Alpha system usually have to concoct a homebrew system. The Sony radio trigger situation has improved somewhat, as some manufacturers have started to offer Sony compastible triggers, but finding a system that offeres full compatibility as well as reliability is still, literely, a shot in the dark. Since the 4000AF has the old, universal hot foot, this eases the compatibility problem somewhat. The remote 4000AF will fit standard radio receivers, so all you need is radio transmitter that can be fired from the Alpha. So now we’ve figured out how to fire the 4000AF from the Sony Alpha, we need to figure out how to hold that big flash unit in place. That will be the subject of the next post in this series. This is the second post in a multi-part series which explains how to use the Minolta 4000AF Flash Unit on the Sony Alpha. Since I advise against using the flash on the hot shoe, the next post in the series will explore options for holding the Minolta 4000AF during a photo shoot. This entry was posted in Flash unit and tagged Alphatracks, FA-CC1AM, flash unit, Minolta 4000AF, Off Camera Flash, Photography, Sony Alpha flash, Tom Bonner. Bookmark the permalink. Post a comment or leave a trackback: Trackback URL. Thank you for these articles!! I just got the NEX-7 and your site helped me a lot with getting an affordable off-camera flash solution. I got a 4000af for $32 on eBay an ISO to Sony hotshoe adaptor and the Phottix Strato II radio transmitter and receiver. The flash works great on camera and off! Thanks again!